Whether it’s a classic resto-mod or a R nineT café-tracker, Urban Motor’s Peter Dannenberg sure knows how to tweak a BMW to perfection. 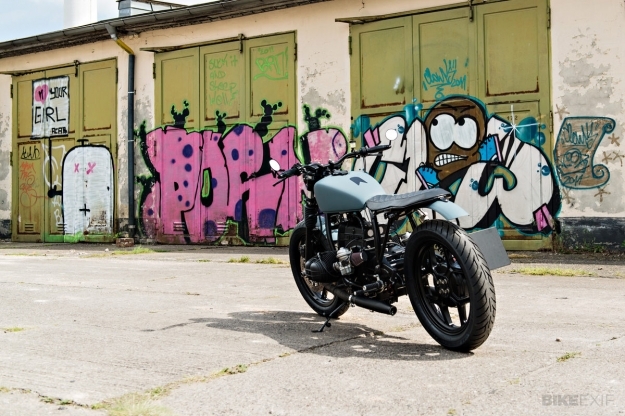 Every build that rolls out of his Berlin workshop is über-clean and cohesive—even when he’s been asked to inject a little Brat style into it. In true bobber style the R80’s been stripped of all superfluous bits and pieces. 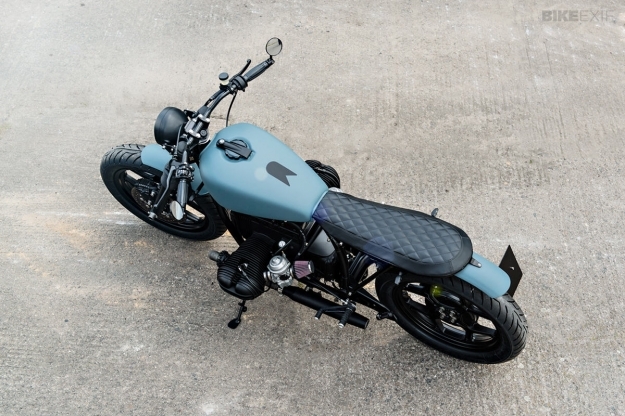 The fuel tank is from a Honda CX500 Custom, and cuts a unique line with the modified subframe and hand-made seat. Dannenberg also dropped the front suspension by nearly three inches, installing Wilbers progressive springs and a new Wilbers rear shock. The braking has been upgraded via a Brembo PS16 master cylinder and Stahlflex stainless steel brake lines. 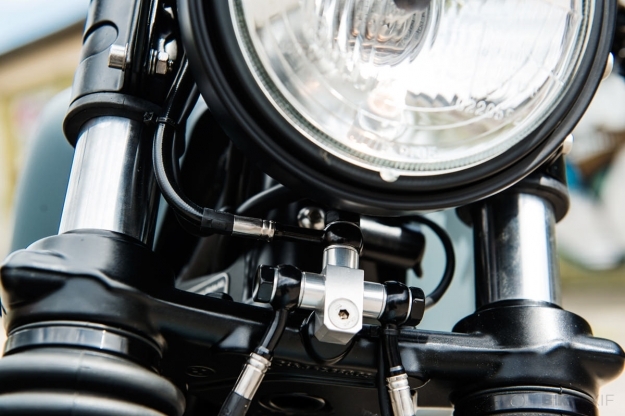 Look closely, and you’ll see a rather trick brake line junction tucked beneath the headlight. K&N filters and a bespoke cut-off plate replace the stock airbox. 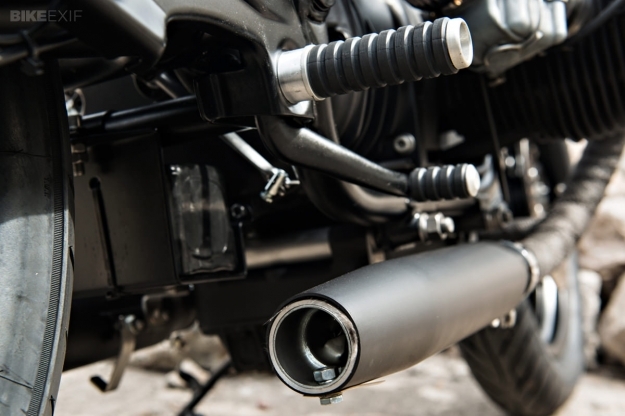 The exhaust system is custom-made, with the headers wrapped in Thermo-Tec heat wrap. Practical tires were chosen for the 18” rims—Avon’s Roadrider AM26. One requirement was that the bike should meet Germany’s strict TÜV regulations. To that end Dannenberg fitted alloy fenders, Blaze LED turn signals (that double as a tail light at the rear) and a 5 3/4” headlight; and fabricated a license plate bracket with LED illumination. The throttle and clutch lever are Tomaselli items, and the rear-sets are from Tarozzi. LSL supplied the handlebars and mirrors, with Beston grips and Minda multifunction switches. 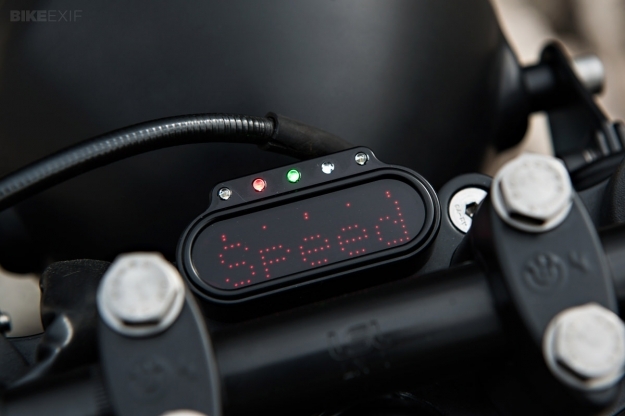 There’s also a very discreet Motogadget Motoscope Mini speedo with a small LED warning light panel. 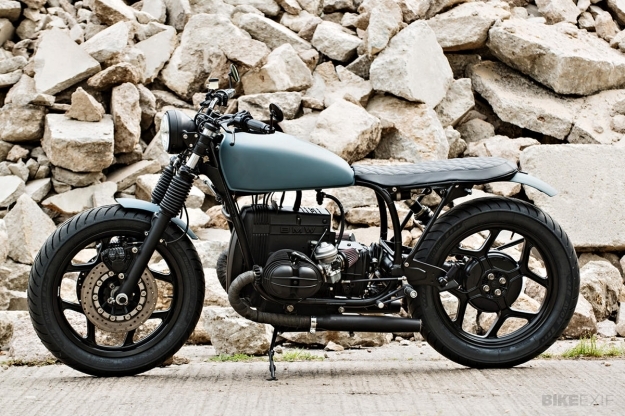 A modest color scheme was chosen: matte grey for the tank and fenders and heavy doses of black for everything else. It works beautifully, and turns the bike into a true sleeper—understated, but laced with Urban Motor‘s signature attention to detail. Photos courtesy of Tim Adler Photography.